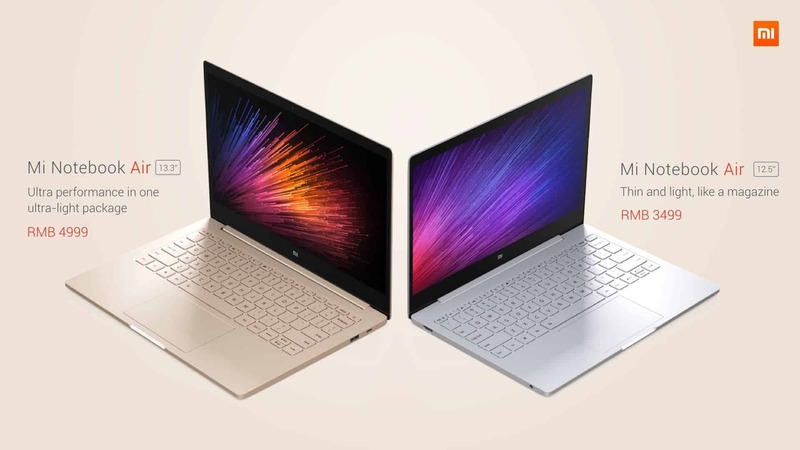 Xiaomi’s has launched it’s much-awaited notebook series called as Mi Notebook Air. In the live conference being held in Beijing today, Xiaomi just announced its twin Notebook Air. Mi Notebook Air is a good competition to Apple MacBook, rather, we can say as Mi Notebook Air is Apple MacBook Air without a LOGO. 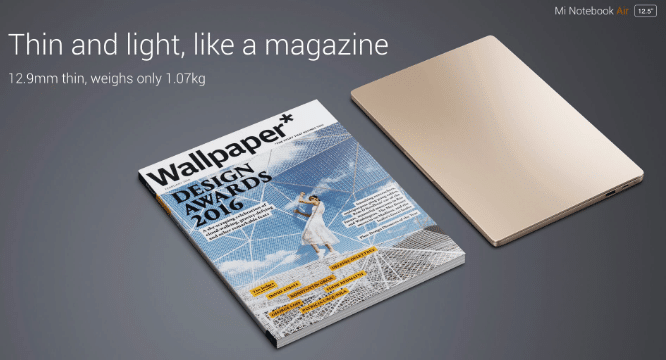 As quoted “Millet notebook Air, Air more than the Air”, Mi Notebook Air comes in an all-metal unibody design. The ultra durable screen of Mi Notebook Air has edge-to-edge glass protection having Mohs hardness of 7H which somewhat costs more than $150. The FHD display is fully laminated to make the screen anti-glare. Mi Notebook Air 13.3” is 14.8 mm thick which is 2.2 mm (13%) thinner compared to MacBook Air which stands at 17 mm thickness. The dimensions of Mi Notebook are 309.6 mm x 210.9 mm x 14.8 mm. With 1.28 Kg weight, Mi Notebook is still lighter than MacBook Air, weighing 1.35kg. The screen of Mi Notebook accounts 80.1% of the laptop front panel, thus keeping a great Screen-to-size ratio. Having the same screen size of 13.3” like MacBook Air, Mi Notebook is still 11% smaller in overall dimensions. 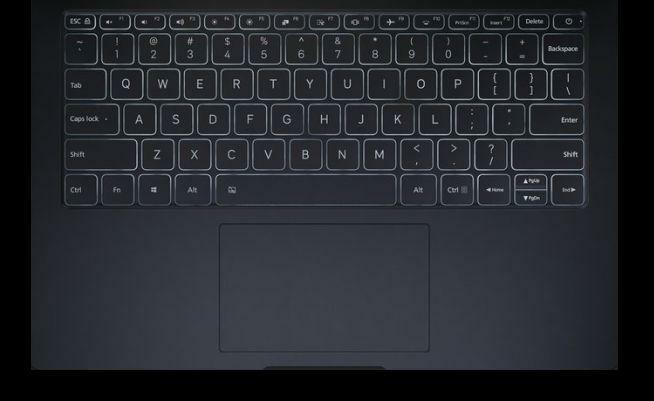 The keyboard is of full-size and is back-lit enabled. The ports included are HDMI, USB Type-C, 3.5 mm Audio Port and 2 USB 3.0 ports. The Mi Notebook Air 13.3″ is powered with Core i5 processor 6th Gen clocked at 2.7GHz. Windows 10 Home Edition comes pre-installed. The 13.3″ model will come with a storage capacity of 256GB SSD along with 8GB DDR4 ram. The 1GB dedicated graphics memory is powered by NVIDIA GTX 940MX. There will be scope to expand the hard drive capacity by installing an additional M.2 SSD in the expandable SSD slot. Mi Notebook Air 13.3” promises to give you juice for over 9 hours. Mi Notebook promises to provide Fast Charge by charging 50% battery in 30 mins. This is a deal maker!! The dual speakers are provided by AKG and will boost Dolby Surround Sound. It unlocks with Mi Band 2 when you are near your notebook wearing Mi Band in your hand. 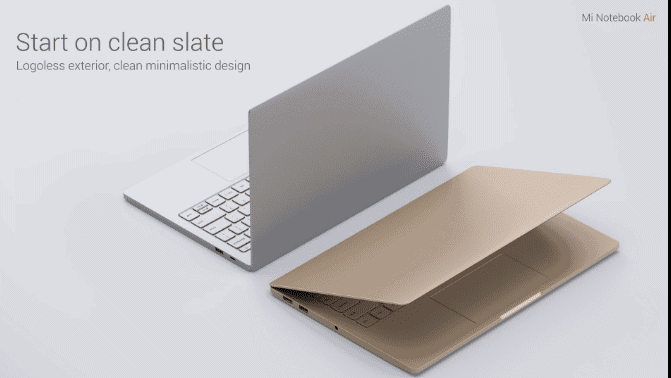 There are one slimmer and lighter version of Mi Air Notebook being launched which is sized at 12.5”. The 1080P FHD screen notebook is powered by Intel Core M3 processor, it comes with the storage capacity of 1228GB SSD and 4Gigs of ram and expandable SSD slot. It is surprisingly thin and light at 12.9mm weighing 1.07kg. The battery life is around 11.5 hours. It has got the same AKG Dolby digital surround sound capable twin speakers. You can sync your contacts, gallery, messages, notes and other data across your Mi Notebook Air and Mi Phone via Mi Cloud Sync. Finally, comes the price! Mi Notebook Air 13.3” is priced at 4999 CNY which roughly converts to Rs. 50500 INR. The slimmer version Mi Notebook Air 12.5” is priced at 3499 CNY which is around Rs. 35500 INR. The Mi Air Notebooks will go on sale in China from August 2nd.